Our Company manufacture flat stitching wire, box stitching wire, & & flat galvanized stitching wire. Our team has developed knack for manufacturing flat stitching wires to export to every nook and corner of the world. Our flat stitching resistance galvanized wires. These stitching wires boast consistent tensile strength. The measurements of our flat stitching wires range from 2.03mm to 2.5mm. Dhanlaxmi Industries is one of the eminent Box stitching wire suppliers exporting stitching wires for corrugated boxes. We offer supreme quality of products to our clients. 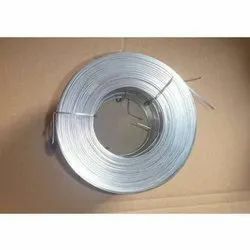 On client request, we can dispatch the best quality flat stitching wires in different packaging in plastic spool packing, regular packing, coil packing etc. This makes us one of the reliable flat stitching wire exporters. We are one of the top-notch wholesalers and supplier of quality assured Flat iron Stitching Wire. Fine-tuned to meet diversified need of various industries, these wires are extremely suitable for stitching corrugated boxes. Our entire range is manufactured using high grade basic material and latest machinery at vendor’s end. Further, our offered products are tested on various parameters of quality before delivering them at clients end. We offer our entire range at industry leading prices.